I added notes at the bottom of each screenshot where I thought things might need additional explanation. At the end of each day I fill out the tracking page for that day. When Sunday rolls around, I flip through the pages and aggregate the results on the summary page. Summarizing the results at the end of the week is a good idea because it lets you quickly gauge how you’ve done and it provides a quick reference so you can compare your progress with previous weeks. This system works well for me and it might for you too. But getting to this point was not without its challenges. Here’s a few key lessons I’ve learned along the way, a few of which echo some of Sebastian's advice. If you decide to make a big change in your life, like starting a daily life tracking routine, your best chance of success is to start with a small change and slowly expand it into something bigger. If you disrupt the status quo too much too quickly, you probably won’t stick with it. When you begin, life tracking should barely have an impact on your current routine which means it should take as little time as possible to complete. My first attempt at tracking was in November 2010. 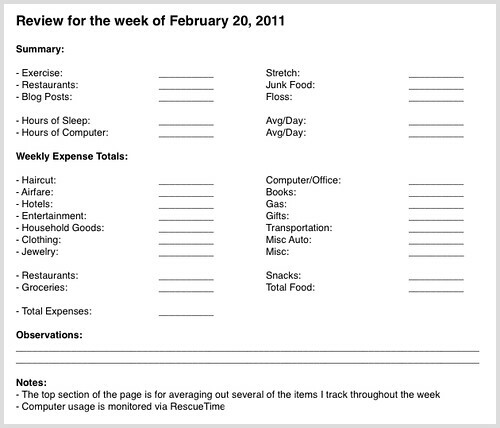 I typed up a daily tracking sheet in Pages, Mac’s equivalent to Word, which I envisioned myself filling out daily. The problem was that it was way too long: one page, including lots of opened ended questions (“What are your goals for tomorrow?”) and fill in the blanks that required me to do research like “How many sign ups on Preceden and jMockups today?”. It took me about twenty minutes to fill out. I stuck with it for about two days before quitting, justifying it by saying that I didn’t have enough time to do this type of tracking. And I was right. When I started up again at the beginning of the year, I started with a much, much simpler version that took about 30 seconds to fill out. As time went by, I slowly expanded it by adding new items. Even now, after nearly two months of adding to it, it only takes me about three minutes to fill out. You might decide that you want to track a lot more than I am and that’s fine, but make sure you start with something that’s quick and grow it from there. If you miss a day or two during the week, you’re going to have a hard time going back at the end of the week and summarizing your results. How, for example, do you calculate the average numbers of hours you’ve slept if you didn’t record it one day? You won’t be able to without either guessing at the hours you slept that night or by qualifying your answer with “On the days I kept track…” which is next to useless. If you’re want to compare your results week to week, there’s nothing more frustrating than not being able to compare a week with another because you missed a day somewhere in there. 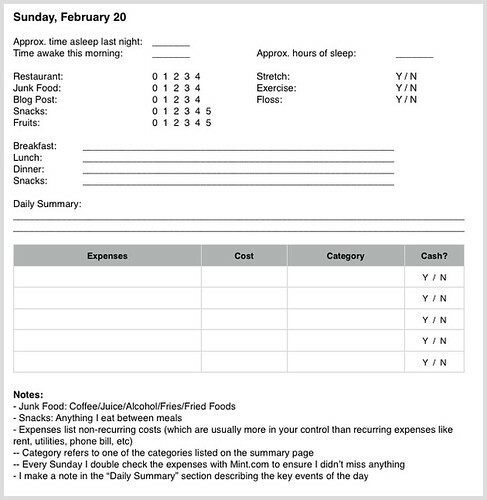 And along with the previous point, a short tracking sheet takes less time to fill out, which means you’ll be less likely to miss a day. I try to mark things on the tracking sheet throughout the day as I complete them and finish the rest right before I head to sleep. If I can’t fill it out for whatever reason, I make sure to complete it at my first available opportunity the next day. Do not wait more than a day to complete it. What time did you go to bed the night before last? What did you have for dinner the day before yesterday? Chances are it will take you a minute to remember, if you can remember at all. For accurate results, complete your tracking sheet as soon as possible. Yes/no questions are the simplest type of responses by far. If you’re just getting started, I’d recommend starting with a few yes/no questions to cover a few key areas of your life. Answering a yes/no question takes about half a second. For my tracking, I don’t even have to write a “Y” or an “N” because I include a “Y / N” next to the question so I can quickly circle the answer. The easiest type of questions to answer next to yes/no are quantitative: How many blog posts? How far did you run? How many times did you eat that thing you’re trying to stop eating? These could also be worded as yes/no questions, but for anything with a quantitative answer you should write the number, not just yes/no, because you get a higher fidelity when you analyze it later down the road. Following quantitative answers, you’ve got fill in the blank: what time did you go to bed? What did you eat for breakfast? Etc. Because these are usually objective questions (ie. there is a concrete answer), filling them out should not take very long. At the other end of the spectrum are open ended questions: What are you goals for tomorrow? What mistakes did you make today? These require you to sit back and really think about the answer. These pay a lot of dividends, but are also the most time consuming to answer. You should avoid these until you’ve settled into a tracking routine. During the first two or three weeks of tracking, I wanted to make changes to my tracking sheet almost daily. "Include this… don’t include that." Resist the temptation to change it daily. It makes aggregating your results at the end of the week difficult and you’ll also change your mind a lot a day or two after you originally decide to make the change. If you want to change your tracking sheet, make a note of it and then on Sunday when you’re preparing for the next week make the edits. How do you decide what to track? Write down all the areas of your life where you want to improve and come up with questions that serve that end. Whether it’s exercising more often, eating healthier, or writing more often, tracking how often you do it will help you gauge your progress and, magically, do it more often. After you’ve met your goal for a specific area, continue tracking it for a few weeks until you’re confident that you’ve made it a long term habit. For example, if your goal is to floss every day and you’ve been successfully tracking and doing it for several months, you can be pretty confident that its part of your routine and that you’ll continue doing it when you stop tracking it. Marking "No" for an item when it should be "Yes" is a bit unnerving at first, but don't feel like you have to do everything every day. In fact, if you are accomplishing everything you want to do, chances are you're not challenging yourself enough. Sebastian says aim for a 70% success rate -- that sounds about right. This one’s inspired by Sebastian’s New Years Resolution post in Get Some Victory: rather than make a whole bunch of sweeping changes to your life on New Years Day, split them up and try to accomplish one per month. A good tracking system should help you achieve these goals. In January, for example, my goal was to cut out coffee and juice from my diet. This month I’m focusing on eating a healthier breakfast (oatmeal and fruit vs. Frosted Mini Wheats). Had I tried cutting out coffee, juice, and Frosted Mini Wheats on January 1, I’d have had a lot lower chance of succeeding than by breaking it up over the course of the few months. The great thing about this is that you could conceivable go forever doing this: identify one area per month that you want to improve, focus on it for that month so you make it a habit, and repeat for the rest of your life. With a little bit of discipline, you can become the best possible version of yourself that you can be. This system works well for me because I started with something simple and then developed it based on my own lifestyle and goals. By all means, gain inspirations from this system and from Sebastian’s, but if you really want to get the most out of life tracking then you should develop your own over time. Experiment with different types of questions, figure out what you like and don’t like, and discover what works best for you. That was really good. And yes, please do reach out and share your own experiences with tracking, dear reader. Want to learn more from Matt? Check out his blog at http://www.mattmazur.com/. If you're doing timelining or design, then checking out Preceden.com and jMockups would also be a good use of your time. Great blog post. I really like this idea. I really would like to see the actual source files so that I can create my own forms. Otherwise it'd probably take me a few hours to get something as pretty as the examples. One of the things I've gotten tremendous amounts of mileage out of it is tracking my time, habits, and life each day. To put it simply - I now realize it's impossible to understand how your life is going without some careful observation. There's a lot of time each day, and knowing where that time goes, what you ate, what you did and didn't do... it's almost impossible to get a good picture of your life without some kind of measuring. Thus, if you want to track your time, please do not attempt to track 20 things at once, because it's unlikely to work. I started very simply, as I described in "The Evolution of My Time/Habit/Life Tracking" - I'd recommend you read that post if you want to do something like this. Homo sapiens used to be a results-oriented species. It didn't matter how someting was done, all that was mattered was the size of the kill, or the amount of nuts and berries that were brought back to camp; this fostered innovation: better weapons for killing prey faster, increasingly more efficient methods of transporting goods, revolutions in cooking food, and so forth.